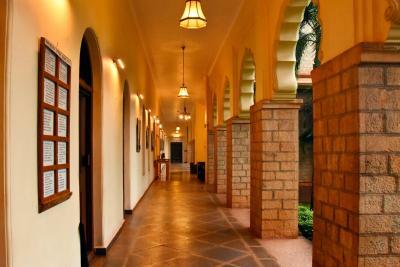 Lock in a great price for WelcomHeritage Shivavilas Palace, HAMPI – rated 9.1 by recent guests! The staff was super efficient and very quick service! Lovely heritage hotel with good food and good service. Everything! A unique experience, the personal attention of the entire staff is outstanding, it is by all means worth to make the trip out here even from Hampi and stay a bit longer to enjoy the palace and rural India. I would always come back, you MUST explore the house and all the marvels in it! Driver services perfect, good investent, visit nearby art&craft project and 1000 year old temple. The venue was very peaceful and quite. I liked being part of a 12 room palace and the attention the staff gave it. The place grows on you very quickly and they make you feel like you're at home. Our driver Shankar was great and really looked after us on our tour around hampi and although it might be an hours drive away from Hampi, the drive was beautiful. I liked having access to Mr Gorpade's library, he had a great collection. I will almost definitely consider going back. Amazing property and very well serviced. The staff is very courteous and goes the extra mile to accommodate any request. Very very highly recommended for anyone planning to relax and unwind. A great heritage hotel with lots of atmosphere.The Duty Manager who checked us in was exceptionally good and any issues we had with our room initially were rectified ASAP with no hesitation to allow us to change the room.All the waiters offered great service and all staff were really friendly.We booked a car directly from the hotel to do a sightseeing tour of Hampi and also a vehicle to take us to Goa both drivers were very good. The building is very beautiful, the rooms are big and with tall ceilings. The bed and pillows were great. The staff was friendly. The food was delicious. Staff service was excellent. Made us very comfortable. Beautiful photographs of birds and wild life. A library too. Decorated with Amazing antique. WelcomHeritage Shivavilas Palace, HAMPI This rating is a reflection of how the property compares to the industry standard when it comes to price, facilities and services available. It's based on a self-evaluation by the property. Use this rating to help choose your stay! Offering an outdoor pool and views of the pool, WelcomHeritage Shivavilas Palace, HAMPI is located in Hospet. The Hotel is just 15 minutes from the Jindal Vidyanagar Airport. Airport transfers can be arranged on request. The property features free WiFi. Every room is equipped with a TV. Some units include a seating area for your convenience. You will find a kettle in the room. Each room is fitted with a private bathroom. For your comfort, you will find bath robes, slippers and free toiletries. You will find a 24-hour front desk at the property. You can play billiards at the hotel. Hampi is 16 mi away while Hospet City is 18 mi from the property. The Hospet Railway Station is 19 mi and the Torangallu Railway Station is 14 mi. 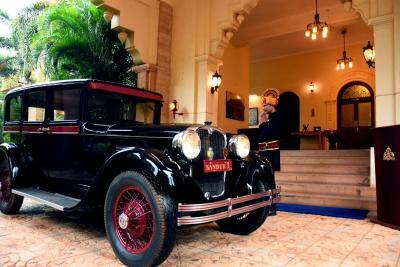 When would you like to stay at WelcomHeritage Shivavilas Palace, HAMPI? This suite features a balcony, view and dining area. This suite has a balcony, electric kettle and executive lounge access. The magnificent property is built over a sprawling area of about 20 acres.The palace has two floors and houses 12 rooms which include 2 grand Suites (Maharani & Maharaja), 10 Deluxe Rooms. 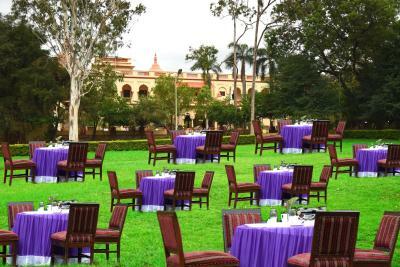 Just relax in palace with in house facilities. House Rules WelcomHeritage Shivavilas Palace, HAMPI takes special requests – add in the next step! Any additional children or adults are charged INR 1000 per night for extra beds. WelcomHeritage Shivavilas Palace, HAMPI accepts these cards and reserves the right to temporarily hold an amount prior to arrival. Contacting the hotel was very difficult and exasperating. The print out of the Booking Form did not contain a contact phone number or an email address. Even the website was bereft of contact details. The imprints of royal lehacy. It’s a wonderful boutique hotel, a palace. Lovely big rooms, lots of old world charm and excellent service. Only drawback was that it’s more than an hour away from Hampi which was the purpose of our visit. Despite the extra two hours of driving, would stay here again if I were to visit Hampi again. Its a little far from hampi. Around 45min drive. Staff's are so kind and soft spoken, we feel like home in this 12 rooms heritage property. NOTHING - ALL TOP CLASS !! SUPERB FOOD .. TERRIFIC HOSPITALITY & SERVICE ... EVERYONE GOING BEYOND THE LINE OF DUTY ... SPACIOUS ROOMS WITH STATE OF THE ART BATHROOMS //VERY SIMPLY PUT : A WOW EXPERIENCE !!! It takes about 40 minutes to get to Hampi.But worth it. A unique opportunity to sleep in a former Maharaja Palace .Large comfortable rooms, access to library and day rooms gave the impression of being a house, rather than hotel, guest.Excellet pool and spa treatment. The one improvement could be some extra food options specially in room dining.